THE HEROIC AGE IS HERE! The superstar team of Warren Ellis and Kaare Andrews (SPIDER-MAN: REIGN) take X-Men into the Heroic Age! Something’s happening in the tiny East African city of Mbangwi. Something that requires immediate investigation. A newborn sprouts metal electrodes and explodes, taking out an entire hospital. 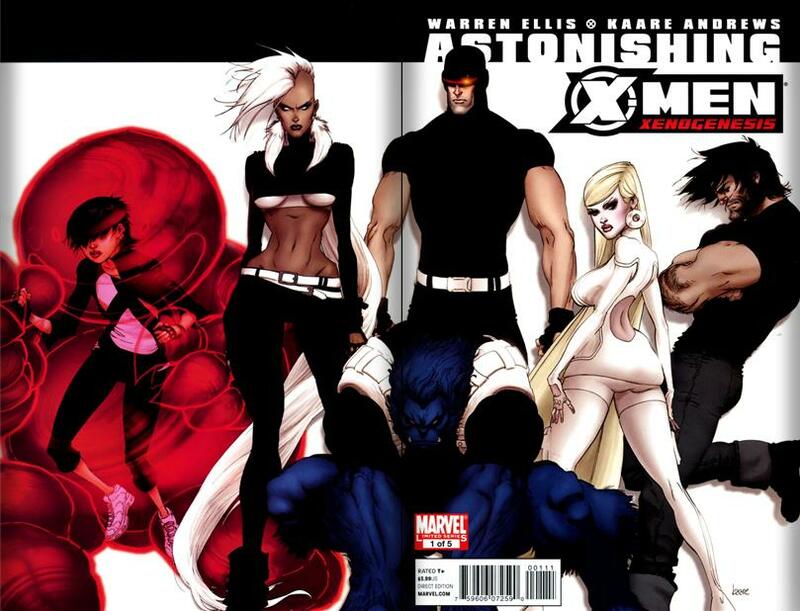 Is this the first wave of mutant rebirth that the X-Men have been praying for…or something very, very different? Something sinister? In Africa a black man flees from gun toting Pursuers. Just as they have him cornered however he unleashes his powers. Elsewhere a black woman is giving birth. Once the child is born however he destroys that wing of the hospital with his powers. 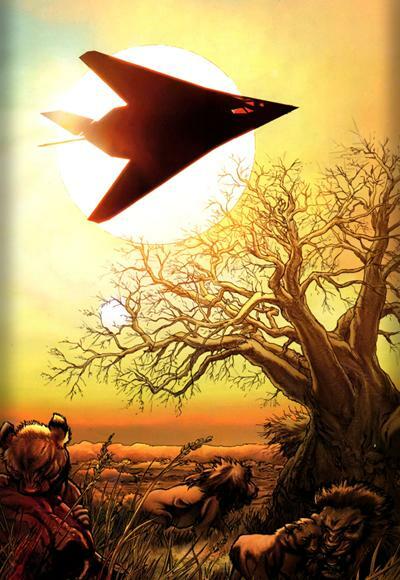 In San Francisco Storm is having a conversation with her husband the Black Panther about a series of unexplained mutant births in a region of Africa. She relays the news to the Astonishing X-men team who decide to investigate. 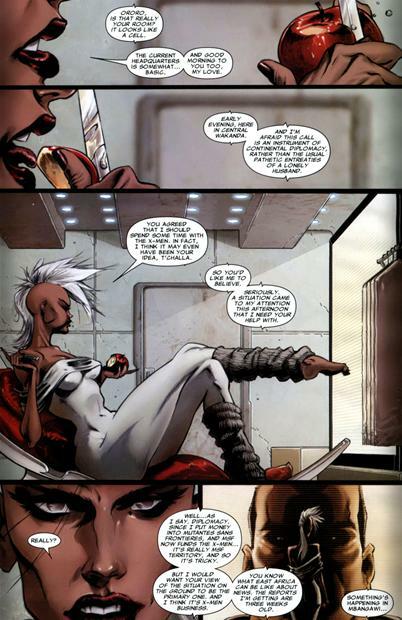 Storm is put in charge of the team since Africa is her field of expertise. When they arrive they are greeted by an army. Thank God Bianchi is gone so our women don’t need to be ugly as dirt anymore! Storm is back to the rocking 80’s Mohawk and away from the Mad Max Thunder Dome inspired poop which happened in Astonishing X-men #25. The characterization for the team was spot on. Emma was bitchy and scantily clad, Scott was the soldier, Hisako the rookie and Logan the thug. The parts of the story which stood out however was the recounting of Mandela’s past which was a history lesson worth the cover price. Dark past and even a terrorist to some, it’s always good when a comic book can be both entertaining and educational! Wolverine as a historian was also great use of his character since he has been around literally forever and has insights that no one else on the team possible could have. Storm gets the spotlight with mentions of her time as a goddess in Africa and being handed the reigns of the team 🙂 good times ahead! Can we please NOT have every African story revolve around the stereotypical “Dirt Poor stupid Africa” please!? 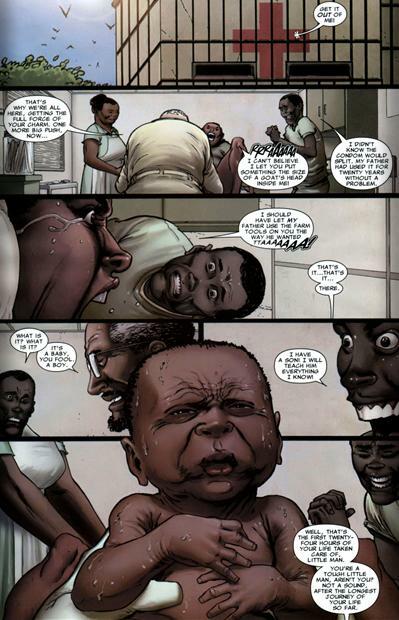 The scene where the child is being born and his father remarks that his father had used the same condom for twenty five years is the single most ludicrous thing I’ve read in a comic in easily five or more years. Note: to Warren Ellis have you ever seen a used condom days after it’s initial use? As a college grad that partied very hearty I have….not usable for another time much less for twenty five years. I’m just sick and tired of the portrayals of Africa in comics besides the Black Panther series! I mean its bad enough CNN only runs the “whoa is me” African stories with starving malnourished children but c’mon it’s NOT the only thing that happens in Africa! The world cup, Miss World etc none of these things ring a bell? Africa does have real rich and thriving communities and cities as well. Let’s get off the poor as dirt routine please!? The near flirtation of Scott and Storm was…..different….never seen a hint of this anywhere else before, can’t say I’m a fan since both are “taken”. I have no idea where this story fits into normal continuity. Why was Storm barefoot? She’s never been portrayed as a barefoot kind girl since she came to America so WTF was that? Was this a way to “nativise” her for her trip to Africa? Why is it that we keep hoping that white writers will see Africans and American Blacks as anything other than stereotypically inferior? It’s an ‘inbred agenda based mentality’ that can’t allow for anything else outside of it except tokenism. I defy you to show me one comic book, even ones with a Black character lead, that doesn’t do one or the other.